I awoke on Day 2 minutes before the crack of dawn… all thanks to a flock of seagulls seated outside our window whose call sounds a lot like an obnoxious cackle (I heard it plenty during the Bath leg). It was just as well, however, since Day 2 had us scheduled to join Mad Max Tours’ Cheddar Gorge, Glastonbury, & Wells Tour. Plenty of photos lie ahead in this post (and the posts ahead), along with my review of our Mad Max experience. Let’s take a gander, shall we? With an early start to our day, we had plenty of time before we had to meet up for our tour. 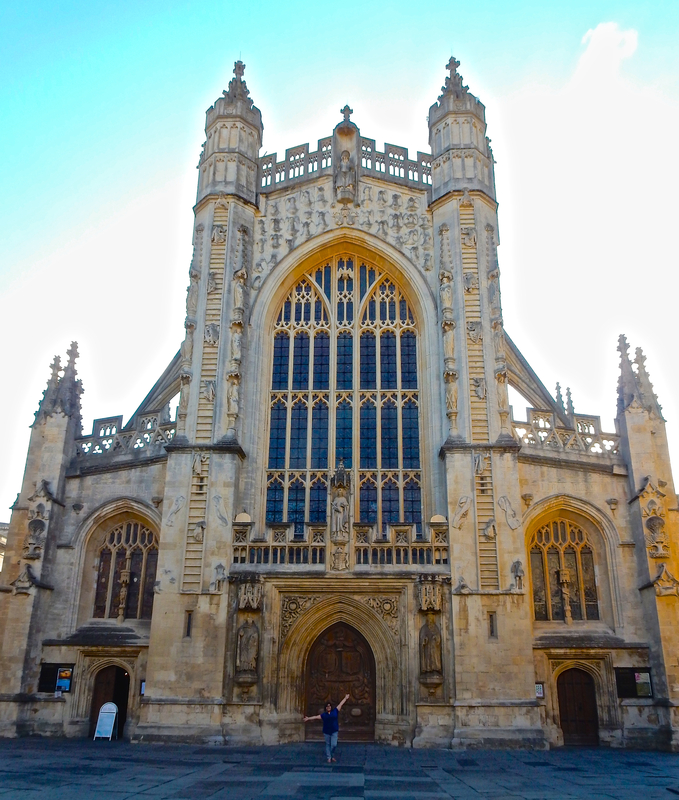 Thus, after a nourishing Pret A Manger breakfast, we carried on towards the little square in front of Bath Abbey, which, at 7:50am, was deserted. 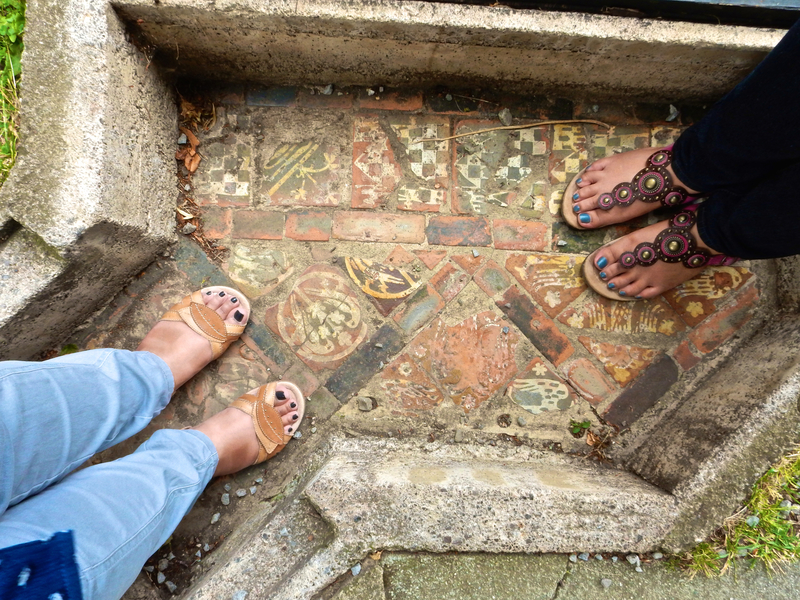 This allowed the sestra and I to take many photos uninterrupted; a few hours from now, and this very same square is crawling with tourists visiting both the abbey and the Roman Baths, whose entrance also fronts the square. 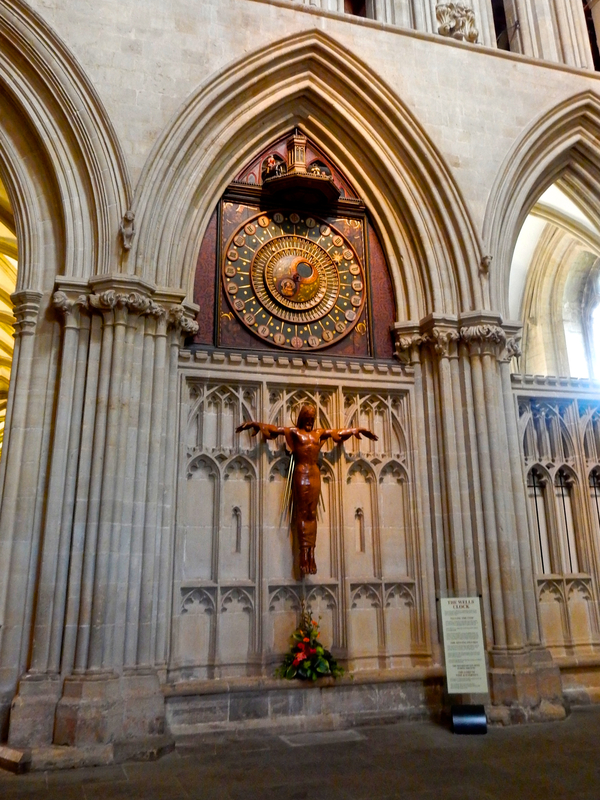 The grounds have held a place of worship since at least the 7th Century; the abbey itself is a fine piece of Gothic architecture, whose detailing is quite astounding. 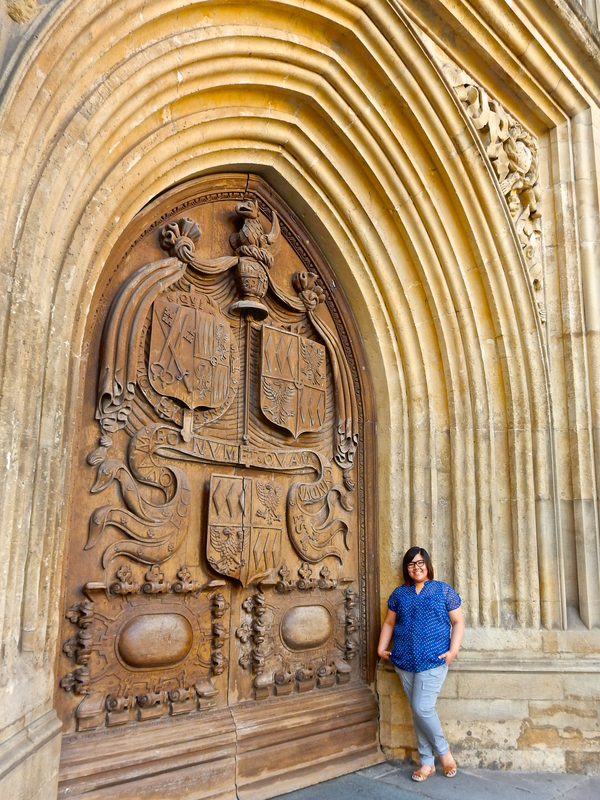 The west front, as seen in my photo, was constructed in the early 16th century. From there, we made our way to the Mad Max Tours (here on out referred to as MMT) meeting point just outside of the Best Western Abbey Hotel – central and extremely easy to find. Just as easy to spot was the tour bus itself! We saw MMT’s Stonehenge tour (which leaves earlier than their other tours) drive off, and our bus soon arrived shortly after. I booked us in several months in advance and had corresponded with Maddy and her team a few times leading up to our trip. Every response was positive, prompt and courteous, and left me looking forward to the day itself. I’m happy to report that the experience did not disappoint. There are quite a few tour groups that tour out of both London and Bath which head out to well known sites (MMT’s best known tour is the one that heads out to Stonehenge), but after doing research, I chose MMT because of how it was run. It doesn’t feel like a corporation or big business, but rather one run by a family or small group of passionate people that just love what they do. As a result, the tours themselves are also small – rather than being herded around on a giant coach, we were in a nice, clean minibus (better maneuverability throughout the smaller roads), and this tour takes no more than 16 guests. 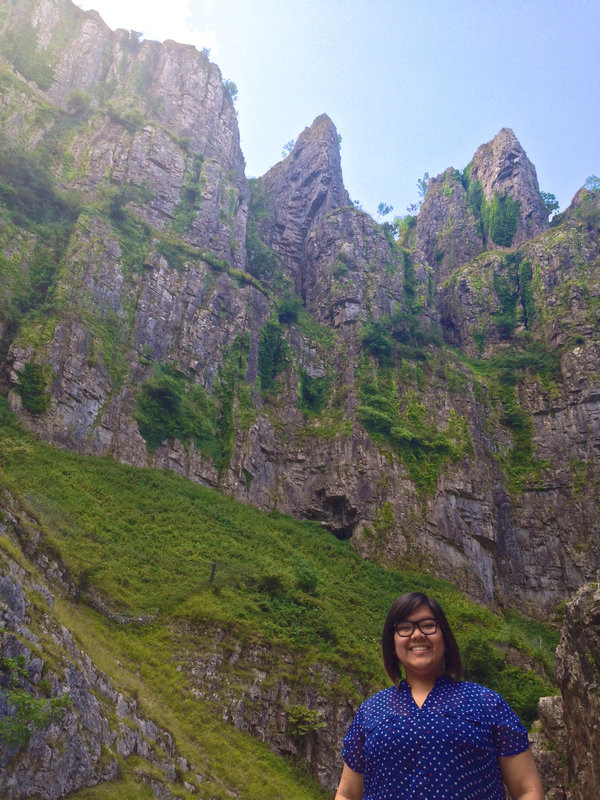 I chose MMT’s newest tour, the Cheddar Gorge, Glastonbury, & Wells tour, for several reasons. 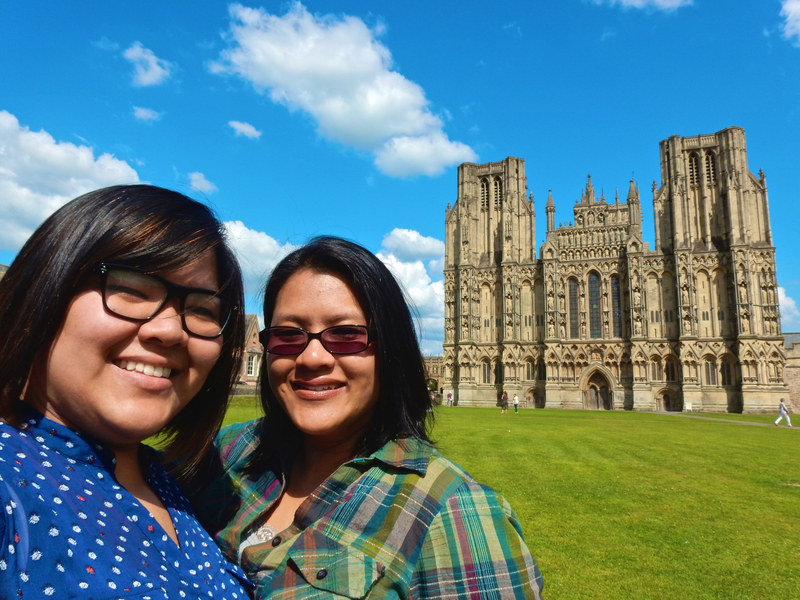 I wanted to see the gorge, I wanted to see Glastonbury Abbey, and I wanted to see Wells (where they filmed one of my favourite movies, Hot Fuzz). I also wanted to visit places that were less touristy (compared to Stonehenge, anyway). This paid off – there ended up being seven of us (Mrs. Mueller and your plus one, it will forever be a mystery why you didn’t show up for the tour) plus our lovely guide/driver Mike. At £38 per person, having such an intimate tour without ever feeling rushed or herded around was an absolute gift. 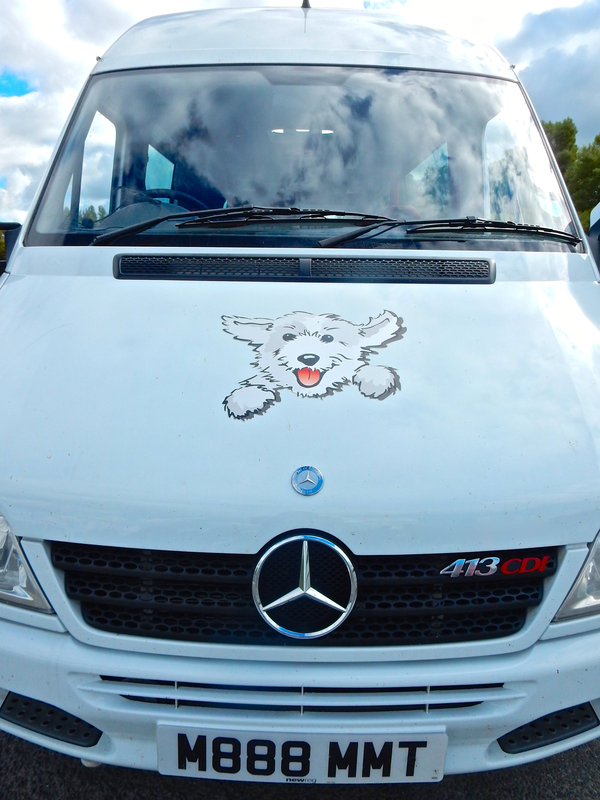 The drive was extremely comfortable and the minibus was spacious. One thing I really enjoyed was how relaxed the pace of this tour was. Unlike the Stonehenge tour, which had a timed booking, the pace of this tour was dictated by the guests’ interests! We could linger a bit longer at one place, perhaps have a little less time at another, and there was no need to rush anyplace. As well, the itinerary for this tour is mapped out so that there are no excessively long drives. 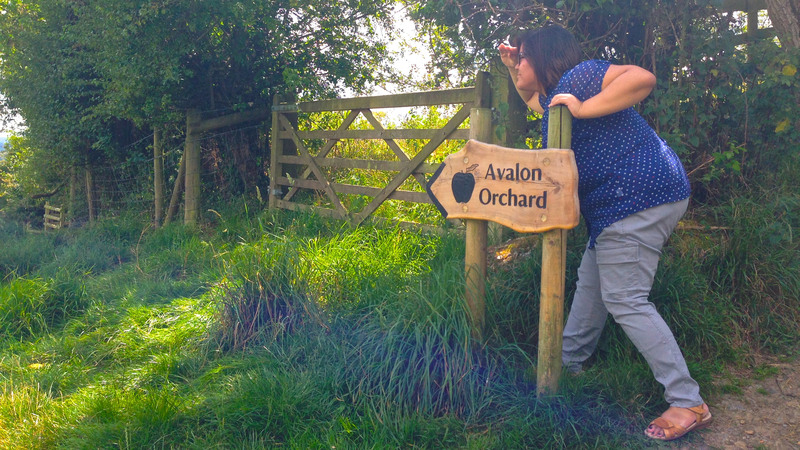 Case in point: on our way to the gorge, we had a rest / photo stop at Chew Valley Lake, a man made reservoir which serves as drinking water for nearby Bristol, but is also now a trout lake and a birdwatching hub. 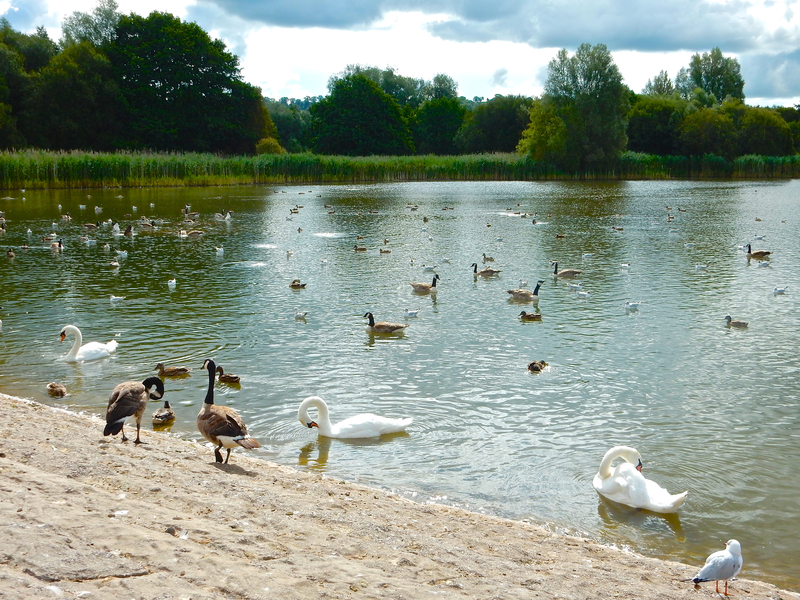 After a few photos and the opportunity to feed the fowl, we carried on. What came next absolutely blew my mind. 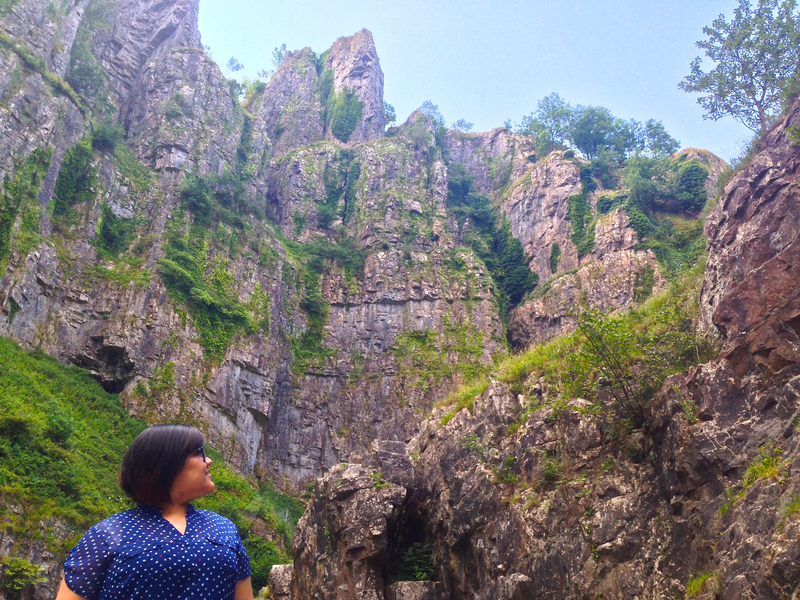 Cheddar Gorge, a limestone gorge carved into the earth, is a part of the Mendip Hills – one of the Areas of Oustanding Natural Beauty in England, and it really isn’t hard to see why. They tower over you, sharp and jagged, and are absolutely stunning. The sestra and I immediately compared it to The Vale of Arryn, and it was a privilege to be able to pause and take in our majestic surroundings for a few good minutes. 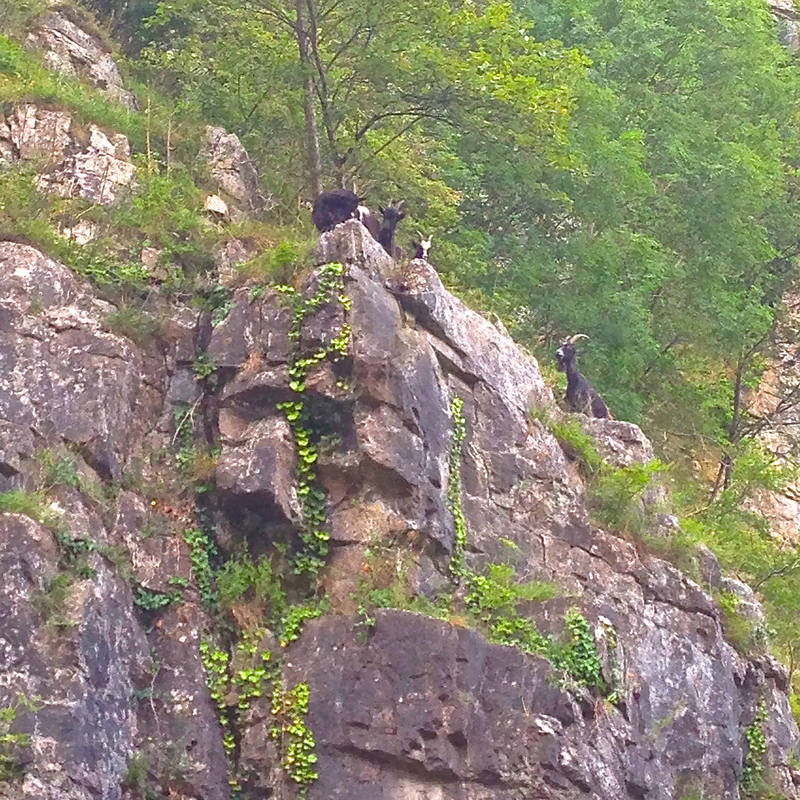 It was equally as amazing to have been able to catch a glimpse of Soay Sheep – a primitive breed of sheep (that look like goats) who live in the gorge. By some miracle, they’re able to navigate the cliffs and walk along 85˚ inclines with no apparent problem! We saw several of them, including a few lambs. Fittingly and unsurprisingly, I began to sing, “High on a hill was a lonely goatherd,” and a grand total of two people got my reference. Oh well. 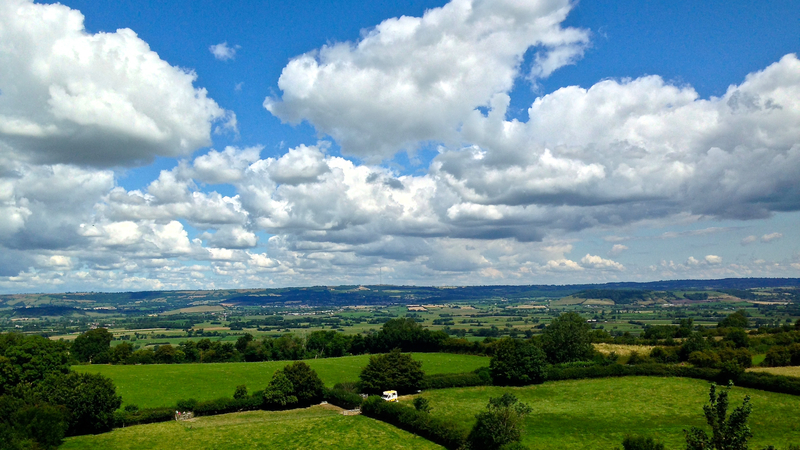 Carrying on from Cheddar Gorge, we proceeded to Glastonbury. A cool thing about the MMT tour was how knowledgeable our guide Mike was. He’s a stonemason by trade and actually met Maddy (MMT’s owner) whilst doing work on her house! From there, he got involved with leading tours. It was great hearing things from his perspective, especially because I’m fascinated with historical architecture. Thus, his little stonemason tidbits of info added so much more to the tour for me. On top of Mike’s informative narration, he also occasionally plays a recording of Maddy (the owner) herself timed perfectly to play at certain points on the journey, where she delves into detailed history, lore, and background information about the place we’re next headed for. Upon arrival at Glastonbury, our group was given free time to do whatever we wanted – another fantastic element of the MMT tour. This meant that while my sister and I made a beeline for the Abbey ruins (which is what we really wanted to see), our other tour companions didn’t necessarily have to do the same. Everyone had a chance to explore what they wanted without being herded around. It was absolutely heartbreaking to be surrounded by the ruins. Not because they were unattractive or uninteresting by any means, but rather, I got stuck imagining what it would look like today if the monastery and abbey had not been utterly desecrated. 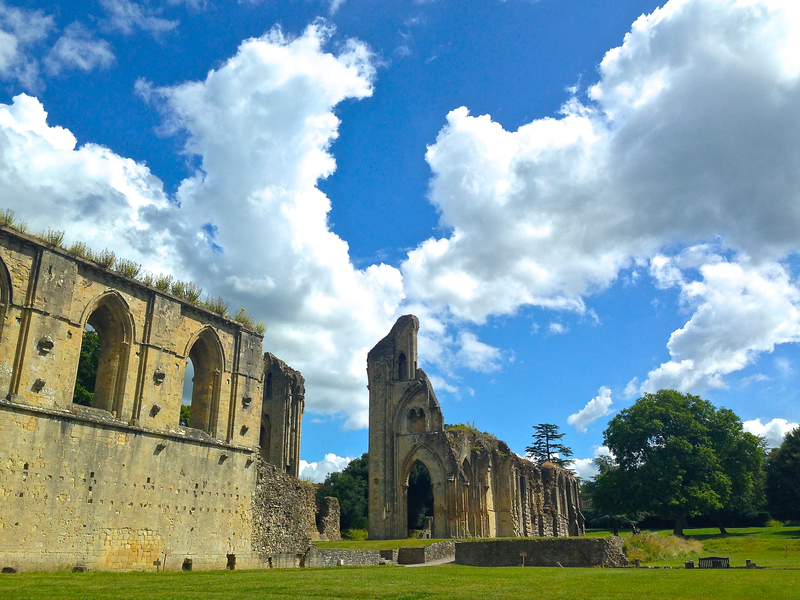 In medieval times, the monastery grew powerful, and its opulence was reflected in the Abbey itself, as well as the Somerset levels surrounding Glastonbury, whose tracts of land (and all that grew in them) belonged to the monastery. Naturally, Henry VIII came to covet this power. That, along with the Dissolution of the Monasteries upon his break from the Catholic Church and creation of the Church of England (of which he was head), led to the destruction of what could’ve been an amazing piece of history and likely a continued place of worship today. 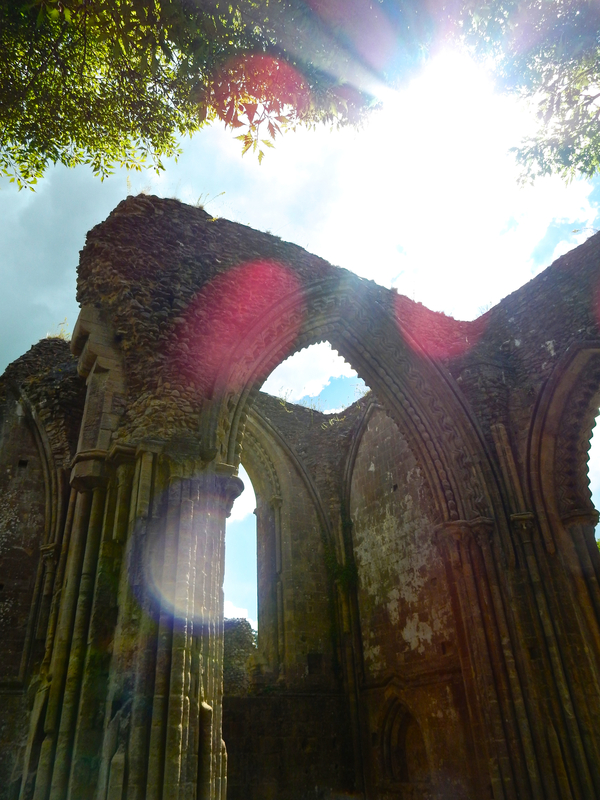 Of equal interest to the ruin’s religious history is its association with Arthurian lore. 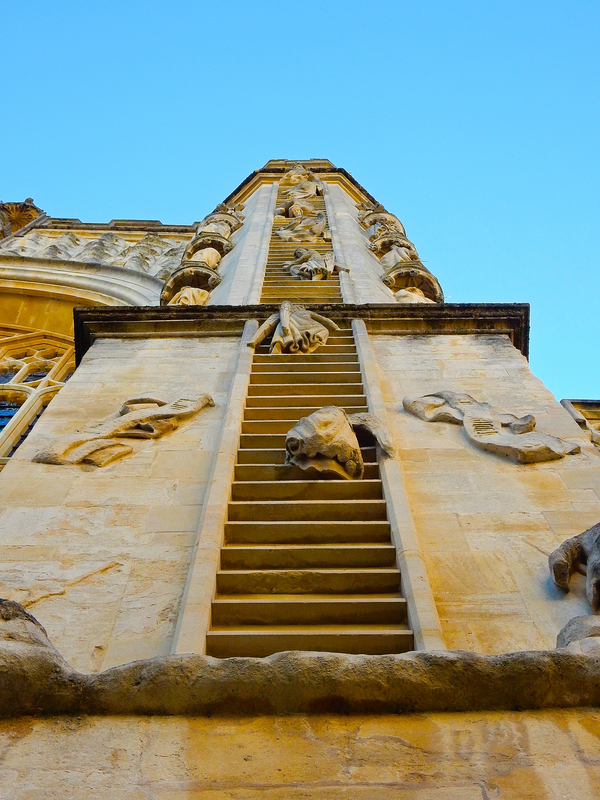 As seen above, the Abbey has had ties to King Arthur for nearly a thousand years. 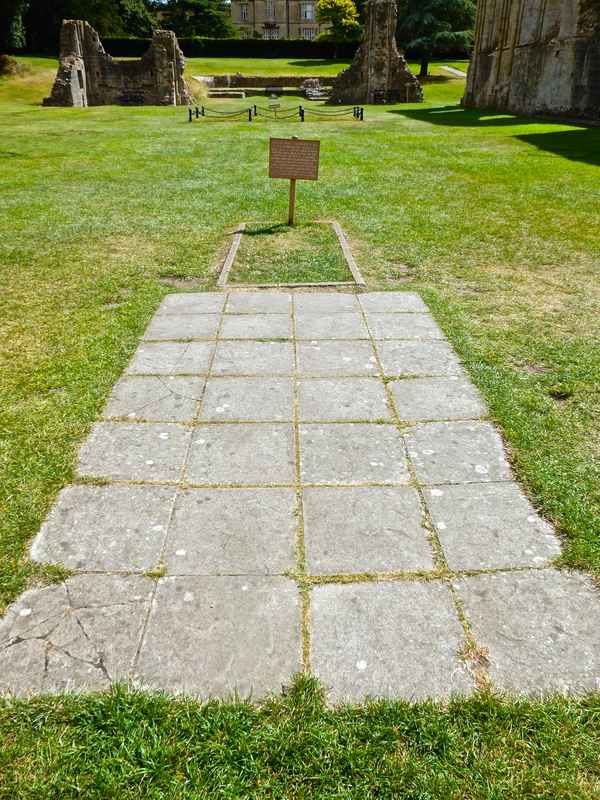 While nothing now remains of this supposed tomb, many still flock to the abbey as well as the nearby Tor because of its connections. 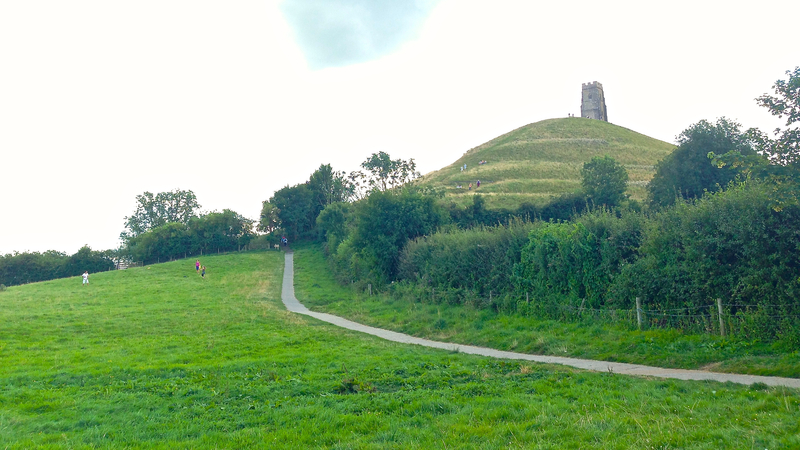 After our free time, Mike rounded us up and we proceeded to Glastonbury Tor. With a commanding view like that, you can see anyone approaching your lands in all directions! As well, in ages past, the levels used to flood significantly and the Tor would almost be like an island floating amidst the water. Like the Abbey ruins earlier, the Tor has ties to Arthurian legend – records from 12th and 13th Centuries show that it was called Ynys yr Afalon – The Isle of Avalon – by Britons. You can imagine why; the flooded levels would isolate the tor, and mist rising from the waters would create a mirage which – fittingly – we call Fata Morgana today (after Morgan le Fay of Arthurian legend. Click that link to see an image of the Tor “rising” from the mist. 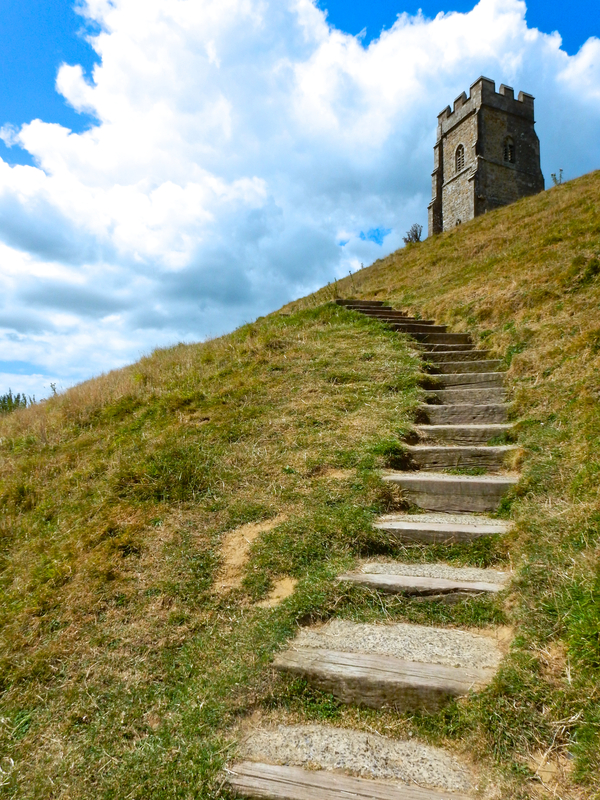 The Tor today has a path which they recommend visitors to follow – it’s a somewhat zigzag route that spares you from a steep incline. The purpose behind this is not to spare its visitors, but actually to preserve the hill itself! Cutting straight through and up would be a far quicker trip (especially if you’re fit enough to do it), however, the constant foot traffic creates erosion in the hill, thus damaging it bit by bit, ever so slightly. By creating the winding path, it allows the majority of foot traffic to do the least amount of damage, and allows this outstanding piece of natural beauty to stand tall for years to come. When we returned to Mike and our minibus (just a few yards from the ice cream truck) we were delighted with a special treat care of Maddy and MMT! 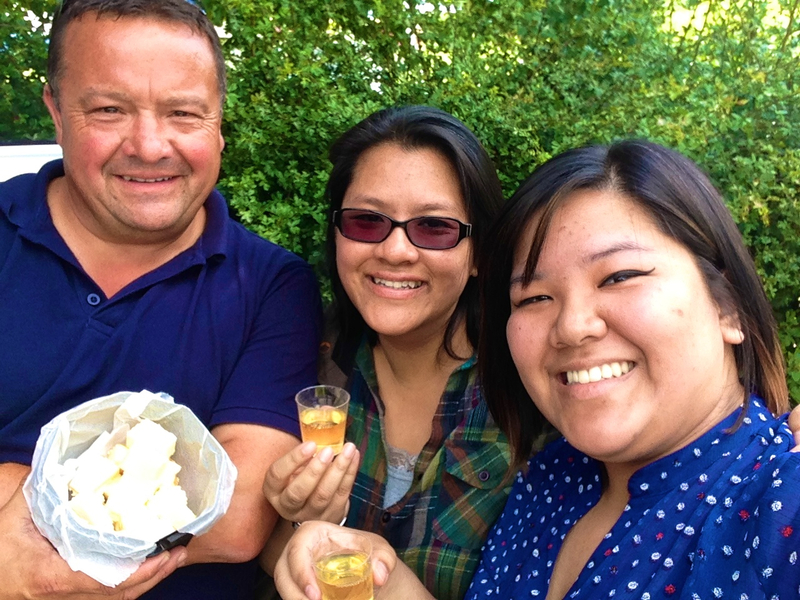 It was a tasting of (appropriately) some local smoked cheddar cheese, and some DELECTABLE cider, which Somerset is known for. Alas, I must tell you now that I did not get to try true knock-you-off-your-feet Scrumpy, but that just gives me a good reason to return! 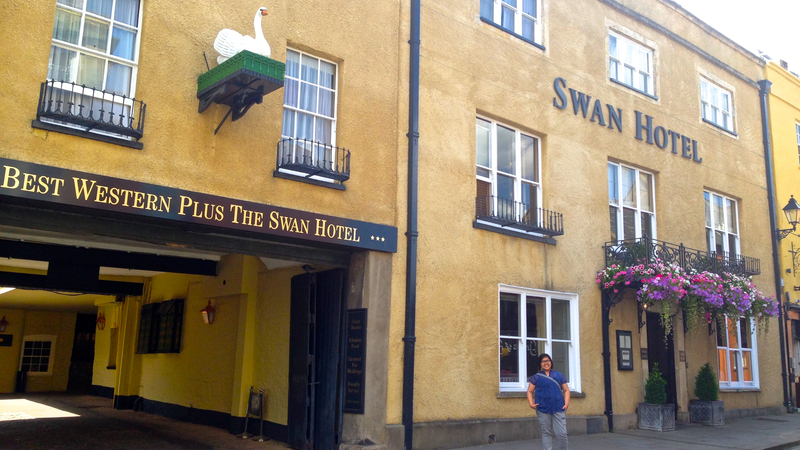 Once we’d had our fill, Mike carried on and drove us to Wells, a teensy little city. 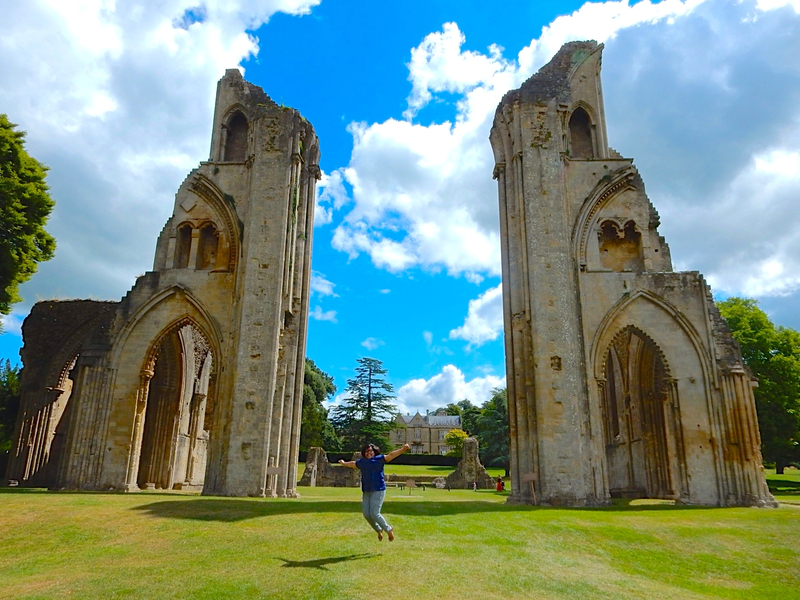 I was very excited for this leg because this is where Hot Fuzz was filmed – Hot Fuzz, my favourite film of Simon Pegg’s Cornetto series! Just like our Glastonbury stop, Mike gave us all free time to grab lunch and explore whatever we wanted to see, and meet up afterwards, so after a brief walking tour together to orient us, we were off! First stop, lunch at The Crown, which was used as the film’s pub of the same name. 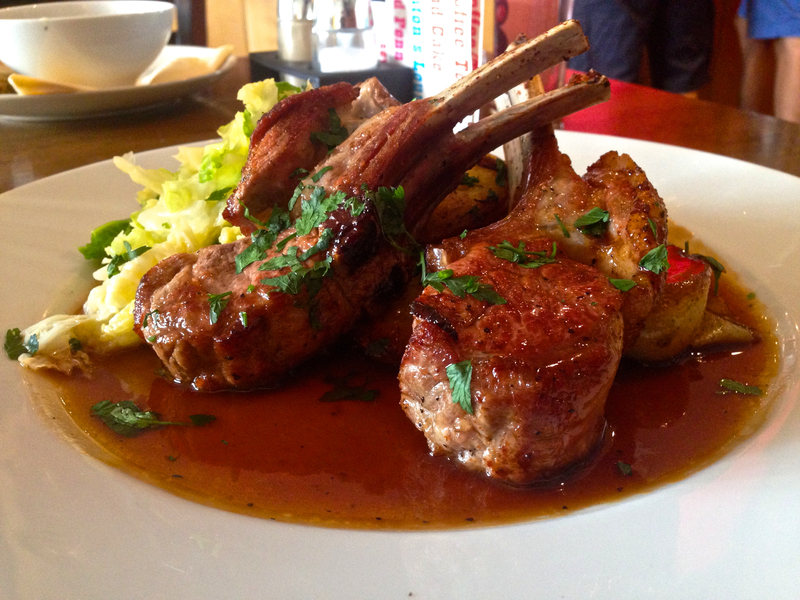 For lunch, I had grilled rack of lamb with roasted potatoes and wilted cabbages… and it was amazing. It’s great to see how pubs have brought their A-Game to the table nowadays; my sister’s pulled pork sandwich and celeriac & apple soup was just as delightful (if a little less heavy). As well, I had a nice icy pint whilst the sestra had cranberry juice – our homage to Danny Butterman and Nicholas Angel. 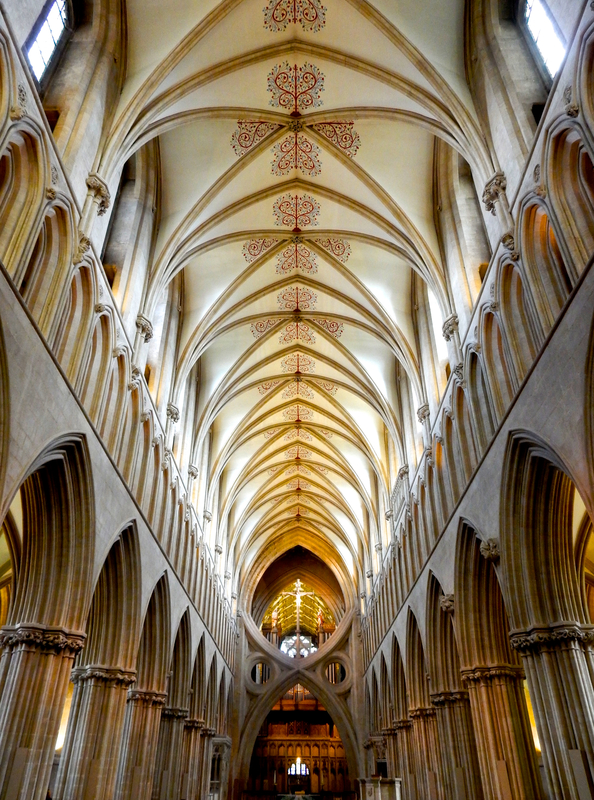 In ages past, in order to qualify as a city, it had nothing to do with size or population density, but rather – quite simply – whether your area had a cathedral or not. If it has a cathedral, it’s a city. 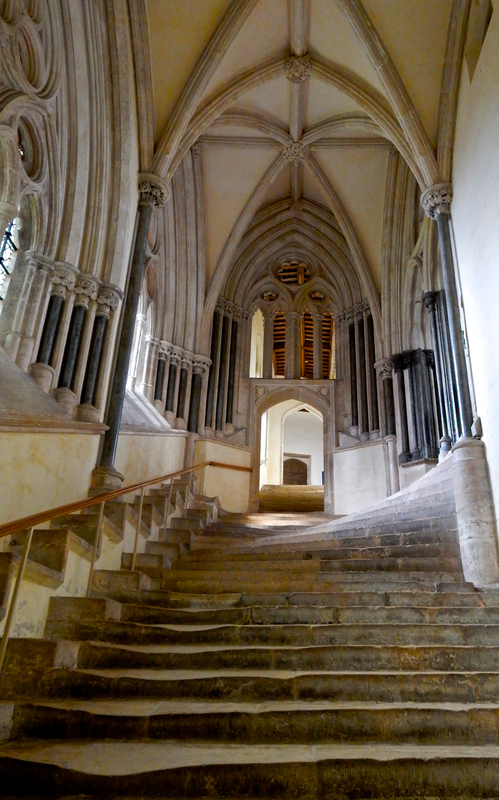 The size of this cathedral blew me away when we first approached, especially for the size of Wells itself, and inside is no less impressive. We saw several cathedrals and abbeys on this trip, and it always amazes me when I pause and think of how these amazing structures were built without any electricity, cranes, or modern technology. Absolutely brilliant. It wasn’t long before our MMT trip came to a close. 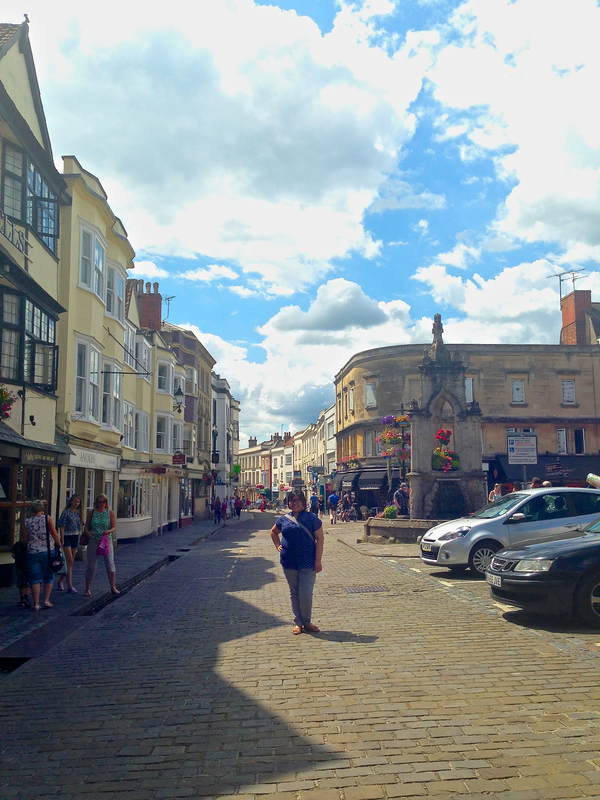 After Wells, Mike drove us back into Bath, leaving me entirely exhilarated for the rest of the trip… and we’re only on Day 2! Thanks again for the amazing time, Mike and Maddy! Once again, I cannot speak highly enough of Mad Max Tours. They’ve got a wonderful thing going and when I return to that region of England I will most certainly join them again. 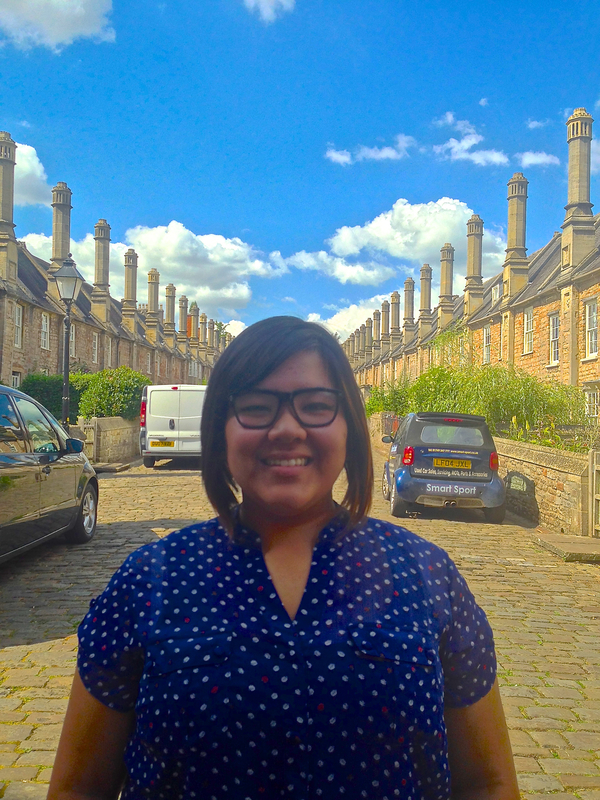 I encourage everyone to check out the Cheddar, Glastonbury & Wells tour with MMT! With them, it feels like you’re on an amazing, comfortable, fun road trip with family – my kind of tour indeed. Stay tuned for Day 3, when the sestra and I venture out to Salisbury on our own… and we end our time in Bath with an epic, epic ride. 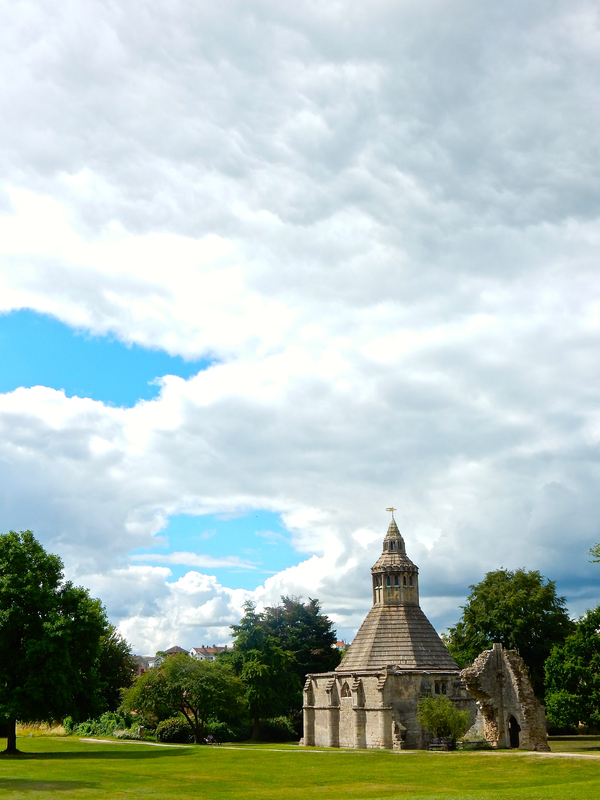 Follow Along on my England 2014 Journey!